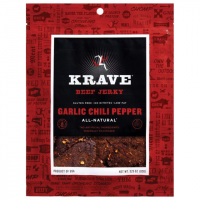 Krave Camp & Hike Jerky Garlic Chili Beef 529107. Gourmet sliced whole meat and natural seasonings. Great for when hitting the trail camping or for an every day snack. Weight per bag is 3.25 oz. All Gluten Free. 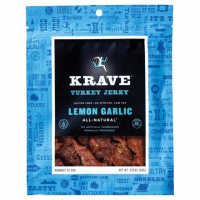 Krave Camp & Hike Jerky Lmn Garlic Turkey 529105. Gourmet sliced whole meat and natural seasonings. Great for when hitting the trail camping or for an every day snack. Weight per bag is 3.25 oz. All Gluten Free.